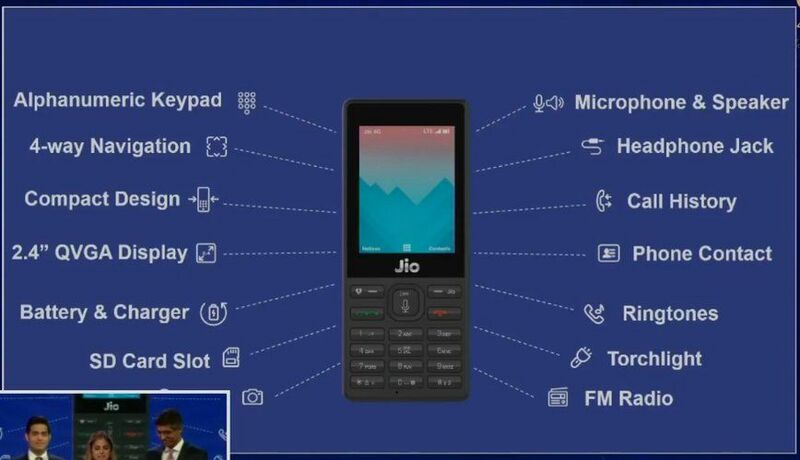 Reliance has launched its new 4G Volte enabled feature phone JioPhone at the company’s meeting in Mumbai. Reliance announced that they have over 125 million customers. 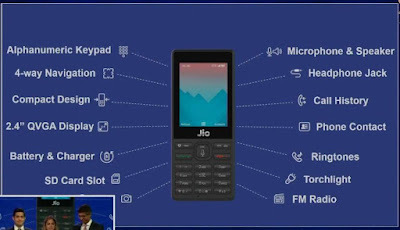 Jio Phone comes with a 4-way navigation buttons, compact design and alpha numeric keyboard. It comes with 2.4-inch QVGA display and it has 4 GB of internal storage and 512 MB of RAM. The Phone comes with Dual SIM and SD card slot for external storage. It packs with 2-megapixel rear camera and VGA front camera. The mobile has the ability to install and run apps, including Jio apps like JioTV, JioCinema and others. The phone comes with a JioPhone TV cable which you can connect the phone to any TV. Users can enjoy viewing videos from JioPhone screen to the big screen. The phone will get NFC support later this year by automatic software upgrade. It comes preloaded with the Namo app and you can listen Prime Minister’s Mann Ki Baat radio programme also. Users can long-press the 5 key and the phone will send message automatically to your dear ones. Also It sends your location coordinates in the distress message. It has also FM Radio, Bluetooth Connectivity, Headphone Jack, Torch light and etc. 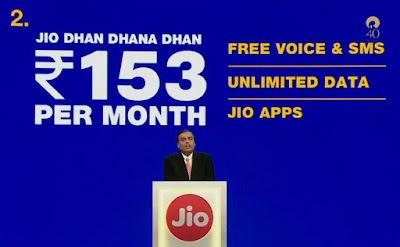 Unlimited data for Rs.153 plan - Users will get unlimited data and free voice calls and SMS for Rs. 153 per month. JioPhone TV-cable pack for Rs. 309 – you can watch the mobile content on any TV in this plan. 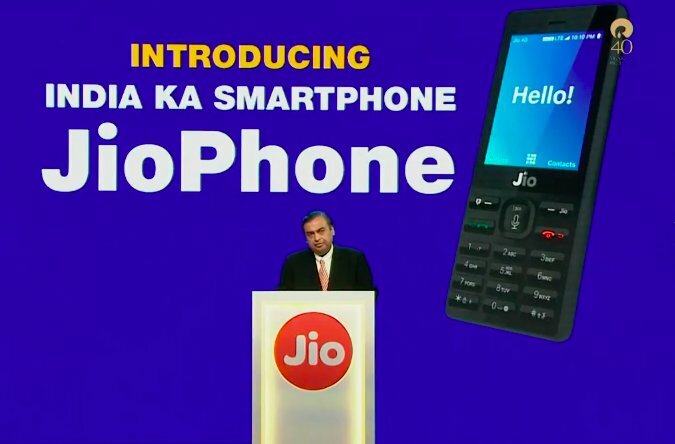 Jio Phone will be available for an effective price of Rs.0 or free. But avoid to misuse, you have to pay Rs.1500 deposit in the starting, which will be refunded after three years. The company claims they will return the money after three years from the purchase date. The phone will be available from August 15th for user testing in beta. Pre-orders for the phone start from August 24th and the phone will be delivered in September month in first-come-first serve basis.